moment when it is revealing itself to be an untenable spiritual position. More and more signs point toward one fact of paramount importance: the famous “modern man” is already looking for a path beyond secularism, is again thirsty and hungry for “something else.” Much too often this thirst and hunger are satisfied not only by food of doubtful quality, but by artificial substitutes of all kinds. The spiritual confusion is at its peak. But is it not because the Church, because Christians themselves, have given up so easily that unique gift which they alone – and no one else! – could have given to the spiritually thirsty and hungry world of ours? Is it not because Christians, more than any others today, defend secularism and adjust to it their very faith? Is it not because, having access to the true mysterion of Christ, we prefer to offer to the world vague and second-rate “social” and “political” advice? The world is desperate in its need for Sacrament and Epiphany, while Christians embrace empty and foolish worldly utopias. My conclusions are simple. No, we do not need any new worship that would somehow be more adequate to our new secular world. What we need is a rediscovery of the true meaning and power of worship, and this means of its cosmic, ecclesiological, and eschatological dimensions and content. This, to be sure, implies much work, much “cleaning up.” It implies study, education and effort. It implies giving up much of that dead wood which we carry with us, seeing in it much too often the very essence of our “traditions” and “customs.” But once we discover the true lex orandi, the genuine meaning and power of our leitourgia, once it becomes again the source of an all-embracing world view and the power of living up to it – then and only then the unique antidote to “secularism” shall be found. This posting is a reflection on the two essays at the end of For the Life of the World, perhaps Fr. Alexander’s most influential volume. It will be tough reading for some. However, I hope to be developing parts of it for easier reading and deeper reflection in coming weeks. I have quoted at length from Fr. Alexander’s essay (a paper read at the Eighth General Assembly of SYNDESMOS in 1971) for it captures well the spirit and sense of that landmark paper. Sadly, some of its most hopeful tones (“modern man is looking for a path beyond secularism”) have perhaps not proven quite true. But the crisis he describes remains. For myself, his analysis and critique of secularism have been the most important aspects of his writings – his liturgical theology being all the more poignant because of its situation within a secularizing culture. In the same essay, Fr. Schmemann describes secularism as the “great heresy of our time.” Secularism does not refer to the separation of Church and state, or a non-Christian or atheist world-view. [Secularism] emphatically negates …the sacramentality of man and world. The secularist views the world as containing within itself its meaning and the principles of knowledge and action. It is this radical division between the world in which we live and a so-called “spiritual” world that I have dubbed a “two-storey universe.” There can be no proper sacrament nor proper Christian life within such a world. In Schmemann’s words: it is a heresy. The crisis of modern man which Schmemann described (in 1971) has passed. The hunger for worship remains, but is now encompassed by a host of other hungers. The world is perhaps more “post-Christian” than at any time in history. Worship has been swallowed up in a sea of secular meaning, a result of the reforms that were only beginning when Schmemann wrote. There can be no celebration of ideas and concepts, be they “peace,” justice,” or even “God.” The Eucharist is not a symbol of friendship, togetherness, or any other state of activity however desirable. The world of feminist liturgies, eco-liturgies, liturgical dance, much less the abominations of “clown masses,” are simply fulfillments of Schmemann’s prophetic vision. Their banal secularism has, however, not diminished, but increased. The heart of the secular heresy, according to Schmemann, is locating the meaning and cause of the world within the world itself. This makes sense for an atheist – for whom there is nothing other than the world itself. For a believer, however, the relationship between the world and God is crucial. In secular culture, God has been exiled to the realm of ideas. The world operates as it does, with God hopefully intervening from time to time (His failure to do this creates consternation among secular Christians). But if the meaning of the world is found in the world itself (apart from God) then it is we who are exiled from God, cast adrift in a universe where God’s absence is our most poignant spiritual reality. Of course, for those who are living the unconscious secular life, God’s absence is quite convenient. He remains aloof until we decide to think about Him. Schmemann’s passion was the insistence on the proper meaning of symbol (and related words). In modern, secular understanding, symbol has come to have the meaning of something which stands in the place of something which is not there. As such, symbols are representations of absence, or, at best, of ideas. They have no inherent meaning – only the meaning which we ourselves assign to them. I have described this as the literalism of the modern world: things are what they are, and nothing more. To this, Schmemann contrasts the Orthodox Christian understanding of the world as symbol. The meaning of this term in the early fathers is not a sign of absence – but a means of presence. Because the world is God’s creation, it is inherently symbolic – it points to and participates in its Creator. Schmemann notes that symbol is part of the very ontology of creation – part of its very being. This is a radical assertion in the face of the modern world. Things do not find their meaning within themselves but within their relationship to God and the nature of that relationship. The whole of creation exists as a means of communion with God. The sacraments are not unique in what they do – all of creation is sacramental. What is new in the sacraments is what they make present. [The Christian sacrament]’s absolute newness is not in its ontology as sacrament but in the specific “res” [thing] which it “symbolizes,” i.e., reveals, manifests, and communicates – which is Christ and His Kingdom. But even this absolute newness is to be understood in terms not of total discontinuity but in those of fulfillment. The “mysterion” of Christ reveals and fulfills the ultimate meaning and destiny of the world itself. My conclusions are simple. No, we do not need any new worship that would somehow be more adequate to our new secular world. What we need is a rediscovery of the true meaning and power of worship, and this means of its cosmic, ecclesiological, and eschatological dimensions and content. This, to be sure, implies much work, much “cleaning up.” It implies study, education and effort. It implies giving up much of that dead wood which we carry with us, seeing in it much too often the very essence of our “traditions” and “customs.” But once we discover the true lex orandi, the genuine meaning and power of leitourgia, once it becomes again the source of an all-embracing world view and the power of living up to it – then and only then the unique antidote to “secularism” shall be found. And there is nothing more urgent today than this rediscovery, and this – return – not to the past – but to the light and life, to the truth and grace that are eternally fulfilled by the Church when she becomes – in her leitourgia – that which she is. Quotes are from For the Life of the World (1973, St. Vladimir’s Seminary Press). “Symbol”, sum (the total) + ballo (throw) = throw together rather then “replacing”. Thank you father for this post. Thank you for this posting. For The Life Of The World still remains my favorite Orthodox book which I read the first time as a catechumen. There is so much highlighting & scrawled notes in my copy that it is now almost unreadable 10 years later. Thank you for your timely thoughts based on it. They are quite spot on today as Fr. Schmemann was in 1971. It is especially good for those who have had no previous exposure to the Orthodox understanding of icons. Father, i think your post illustrates very well how unbelievably painful being a Roman Catholic can be at times! Schmemann’s essay goes directly into Aquinas, and the controversy surrounding Berengar of Tours, where an original split between “real” and “symbol” occurs. Of course the whole dichotomy has grown and morphed since then. The modernist misunderstandings of symbol, that give rise to novel sorts of “Masses,” etc., is perhaps only a very visible sign of the tragedy of secularism. The deeper tragedy, of course, is the division between “real” and “symbolic” that exists within the mind and heart of all of us living in secularist cultures. This is not something to which the Orthodox are immune (else Schmemann would not have written what he did). The union of “real” and “symbol” is the heart of my book, Everywhere Present, and the struggle to live into that union, and thus to live in the universe as it truly is. I think Orthodoxy is perhaps the only context where this is possible for a Christian – though the struggle is well engaged no matter where you are. This is a very insightful remark! The devil strives to separate man from Gof and one of the ways to achieve that is to destroy or de-emphasize in one way or another the things that push man towards his union with God (symbols). As I remember from my readings, the Orthodox take on symbols is that they remind us that there is a spiritual reality (or if you prefer, the spiritual aspect of reality) and a God, and then they help us on the path towards communion with God. I wonder if you have the time you might read this post, as well as the attached comments, and reflect upon it. It seems to speak to the tension between secular world and orthodox (and Orthodox) Christianity, albeit from a different angle. I agree that the world sees a symbol as something that stands for something else that is absent. And I casually agreed with the world. I’m simply not able to stay connected to some Orthodox responses. I’m not trying to be difficult here. It is at this point that I will thank the Grey Pilgrim. I followed the link and learned more about images, idols, and objects through a jackknife and a bureau. To recap briefly – and to relate it to the word symbol – every thing in this world holds value of its own, but if it also points to a source, then it is not just an object but also a symbol of that source. The photo of my loved one who is far away or departed is not just a symbol. The picture has a small limited value according to the amount of paper and ink it holds. But in a mystery, because the photo serves as a link between me and the loved one, it holds its own value PLUS the value that I give to it. I could go on with examples, but does this make sense? Am I on the right track? The HTML formatting left out the (gkkzzt) I hear between each of the initial phrases above…..
Fr. Stephen/Drewster, I don’t know if this is a right way to look at things, but as I was trying to understand the pre-Medieval/Scholastic mindset, I considered the link between a thing’s *meaning* in all its relational/spiritual connections vs. the thing, in and of itself (in its merely material reality, which is a modern and very superficial, or even false, way to understand the world)–a thing’s meaning being the greater and more weighty reality by far–in spiritual terms–than it’s mere fact as physical object. I also made a connection between that meaningfulness being where reality is and the fact that in his Gospel, St. John adopts the term the “Logos” for God, the Son, which, if I remember correctly, is translated “word” in the sense of “meaning/message,” (in this case in the ultimate sense behind the whole universe). We only understand aright the various aspects of our material world insofar as we correctly discern their relationship to the Logos Himself. This helped me also to accept (since I don’t think it’s appropriate to use the word “understand” in this context!) the Church’s teaching concerning the nature of the Eucharist as not merely blessed Bread and Wine, but as containing/being the very Reality of Christ’s own glorified Body and Blood. But – and now I’m stepping deeper into the world of mystery – that added value is something real though impalpable. Let me switch to icons now. The icon of a certain saint has value based on the saint it depicts AND the value imparted to it through those who have given reverence to it. So it gains value because of the relationship of that saint and his/her “communers”, if you will. Going farther with that idea, if we take that icon somewhere else far away, it will somehow mystically still hold that value. Those who are sensitive to it will pick up on the fact that this icon has been loved – even though they did not witness this relationship. They will perceive the added value (yes, I know that term sounds too cold and crass for this discussion, but it can’t be helped). Just as we transfer energy through heat or light or some other form, is it not quite possible that we can give of our energies to these icons, these symbols? I am posing questions and making guesses here, but I do think this would explain why people get superstitious and worshipful of symbols and icons (in the generic sense). And they can go too far. So to speak, the created is mistaken for the creator, the sample mistaken for the source. It is because they are not totally wrong. There IS something to that icon beyond paper, paint and wood. And it is NOT as simple as the Western understanding of looking at the icon just as a means of talking to that saint. Mystically someone(s) have added meaning and import to that object of wood, paint and paper. Drewster, there is truth to what you are saying I think, but I wouldn’t want you to ignore in that equation the Source (Christ) Who alone, and in fullness of Truth and Love, establishes the real value of all. Istm, this is what is most critical to the mind of the Church. This is not totally on topic, so forgive me. Below are the words of Gennadios Scholarios, Patriarch of Constantinople, the first to serve under the Turks. He was a Greek patriot who loathed the Latins. Isn’t it strange that the patriarch found so much commendable in the works of the Schoolman of Schoolmen, especially given his fierce animosity toward the Latin church? What are your thoughts on this, Father? For one thing, you and I are a bit beyond our pay grade here. For another, everything comes from the One Source. But I suspect human beings, created in His image as we are, have been given the ability to share our energies. A familiar example is what the parents give to their children. They don’t just pour money into them, they pour love and life – energies that leave them and add to the children more than the young ones know or understand until years later. I always appreciate your balanced and peace-loving comments. Is then this tendency to pit Scholasticism against Orthodoxy exaggerated? Is the matter more complicated than it seems on its face? Interested to hear the input of other Orthodox besides Father, too. Symbols (which Schmemann says are an inherent part of the nature of creation) do more than remind. They participate and make present, in some sense, that to which they point. Thus they are a means of knowledge and communion. I cannot see anything within the article on Energetic Processions that addresses the question of secular and orthodox. In point of fact, I would argue that there is no such thing as the “secular world.” There is secularism, which is a heresy, but no such thing as a secular world. There is only the world which God created and it is not “secular,” in the sense that secularism understands. It is sacrament and symbol. Right track. Where this truly gets difficult is when we say there is more to the relationship (between symbol and signified) than what occurs in our mind (the weakness of photo and jackknife examples). It is that there is actual participation on the level of ontology (essence or being) that scandalizes the modern mind. All moderns (which would include myself) are born Nominalists. That is, we think that things are just things (simply what they are in themselves) and whatever ideas or associations they have are purely and utterly in the mind of someone perceiving them. The Orthodoxy of the fathers would hold to a form of Realism, in which the relationship between things and the idea of the things (or what they signify) is real – and not merely mental. This is not obvious, of course. Indeed, it is the least obvious thing about creation. In our times, we must be taught this. But, it is one of the reasons that Orthodox approach to liturgy and ritual, for example, differ so essentially from the approach in the West. In the West, they think they are signifying something (to your mind). We think we are actually doing something. It is a radical difference. Is that helpful? Very helpful comments and illustrations. They are peaceful remarks (those of Gennadios). He is writing during the time of the “Western Captivity” of the Orthodox Church, something which obtained increasingly until starting in the 19th century. It still has an impact in many places of Orthodoxy, and Orthodoxy’s emancipation of this Captivity is far from complete. Schmemann is certainly a good thinker when it comes to understanding this aspect of Orthodoxy. The greatest thinker in this regard has been Fr. Georges Florovsky. His works are often hard to obtain. His Ways of Russian Thought is among his most important works, in which he traces the development of Russian theology, and its influences within and without up to near the 20th century. It’s massive and a slow read, but essential when thinking about Orthodoxy and the West. The post, as you know, explores how one understands the Biblical creation stories in light of modern science. The comment section features a debate about the reinterpretation of the traditional creation account. Some of the Orthodox are arguing for a literal interpretation (which they claim as patristic) while others favor compatibilsm (which they also claim is patristic, though less so). I would think this speaks directly to the secular tendency…? Very helpful, but, as you said, unusual for people in this culture to speak this way. They have no category to even begin thinking about it. And thus the reason it easily gets confused with things like magic and voodoo. God help us. In these dark days it’s hard enough just to know how to say a kind word, let alone understand the true metaphysics of the world. You are citing thoughts from within the “Western Captivity,” a period that has come under great criticism (though not always by that name) from about mid-20th century through the present. The critique has grown and is itself important. Of course, the critique of the West is something extremely Western, in and of itself. But it has also been something that has helped Orthodoxy think more carefully about its life and thought and the truth of its existence. The great unchanging repository of Orthodox life and thought is its liturgical life (not unchanging in an absolute sense, but unchanging in the sense of continuity). 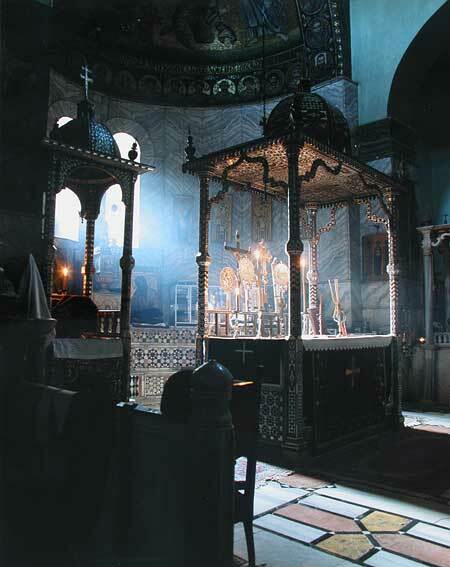 There are periods of history where much of Orthodox thought was thoroughly Westernized, despite the non-Western understanding of the liturgical life. The triumph of the liturgical life – one of the major efforts of Fr. Schmemann – is a primary example of lex orandi, lex credendi. “The law of praying is the law of believing.” It is why the “ersatz liturgies” (to use Schmemann’s term) of various modernized groups are useless as Christian liturgies. They are unable to transform the secular world, for they are merely liturgical expressions of secular culture. If not, and their appreciation was authentic, what place does Latin theology have in the east today? This morning, I awoke to find an enormous billboard just down the street from my house. “RETHINK CHURCH” it proclaimed in some chic and savvy font. Bah. Rock shows and PowerPoint presentations do not a church make. Father Hopko once noted the difference between worship and liturgy. Almost all Protestants — and even some Catholics — have abandoned liturgy in favor of worship. Worship is important, but only liturgy can change the world, as you say. The path to Life is much simpler than we think. Drewster, you hit the nail on the head, five posts up. Well put. I’m suggesting that they embraced aspects of Western thought unconsciously because of cultural factors. The fall of Constantinople had great impact as did the rise of the West before that. The time in Russia, from Peter the Great forward, were culturally devastating (from an Orthodox perspective) with various Tsars and leadership being Westernized, and virtually Protestant and under the thrall (that’s a very good word for the whole thing) of Latinizing supremacy. I am more angry at Rodrigo Borgia than I am at Thomas Aquinas but maybe that’s because I’m more like Rodrigo than I am like Thomas. Thank you for another insightful post Father. Secularism is a Western phenomena. What are the roots of modern secularism? The Enlightenment? Or even before this? Deism seems to have been born around this time i.e. The Enlightenment, or at least informed Enlightenment thinking. But then you had the Epicureans who were around in Apostolic times and well before. The book of Acts even records a debate St Paul had with some Epicureans. They held very similar beliefs to Deists. The gods are neutral and don’t much care about what happens down here, so therefore it leaves humans to find their own way and do their own thing. Perhaps there’s nothing new under the sun? I actually think that secularism’s evil twin is religious fundamentalism. And religious fundamentalism is, perhaps, every bit as dangerous as secularism. It doesn’t matter whether you’re talking about fundamentalist Islam or Evangelical fundamentalism (or Hindu fundamentalism for that matter), they all have an awful propensity for violence. Both fundamentalist Islam and evangelicalism are quasi-Gnostic. Hold to some set of ideals rigidly, even to the point of violence, and you can escape this wicked world and go to heaven. This denies the goodness of creation and God’s desire to renew heavens and the earth, and colludes with the Gnostic notion that surely we must have to escape this wicked place and live a more spiritual existence in some place up in the sky called heaven. Both secularism and Gnosticism seem to be living in a two story universe. And when people react against secularism, there seems to be a tendancy to embrace religious fundamentalism. You guys live in America, there’s no need for me to elaborate on this. But fundamentalism is a very very poor parody of true Christian religion. But the Gospel tells the story about God redeeming all of creation. The miracles (we have to be wary of this word in modern culture because it does carry Deist connontations of a God somewhere up there reaching down every now and then and doing this or that supernatural thing) our Lord performed were not unusual events or “proof” that he really was divine (notice the Apostles did many “miracles” as well – are we to conclude that they are the Second Person of the Holy Trinity too? ), but normal things that happen when God is renewing the world. And so in the resurrection new creation has begun. God is “every where present and filling all things”. God is “all in all” as St Paul says. The earth will be “full of the knowledge of Yahweh as the waters cover the sea” as Isaiah puts it. So I think it’s right to take down securalism, which colludes with Deism. It’s equally important to take down religious fundamentalism, which colludes with Gnosticism. But what are we to DO, practically speaking? I mean, how can we really come to know this and to convey it to others? It’s not enough to ‘understand’ or even to be able to explain it to others. Are you (and Fr Schmemann) meaning that we all individually need to return to simply the hard work of participating in the full liturgical and prayer life of the Church? It is pretty shameful to watch Catholic and Orthodox priests beat one another with brooms (and whatever else is handy) on high holy days in shared churches in Jerusalem. No need to be mad at any one. I invent secularism every day. It is interesting (these brawls – they happen often this time of year). They have several roots (too easy to judge from here). One root is the conditions under which the Church of the Resurrection exists, established by the Turks, but born of the Crusades. The shared space and time creates difficulties which the masters of the temple (Turks, now Israelis) really don’t mind. They like Christians fighting each other. Another root is simply in the hearts of those who are there (which are no worse than our own). They recognize the holiness of all around them, and in their zeal, become like Peter and cut-off the ear of Malchus. I don’t hear a lot of judging of Peter. Christ says to Peter, “Put away your sword.” In this year’s case, “Put away your brooms.” Same thing. Don’t be so scandalized. Secularized Christians don’t care enough about the holy to fight anyone. They would rather kill for oil (be scandalized). Indeed! That is the question. I’ll be posting at length on the topic shortly. However, in the meantime, brief thoughts. It begins in the liturgy. There are things that we try not to do (this is bringing a secular mind into the liturgy – I’ll get very detailed on this) and the other is being open to the nature of reality revealed to us in Christ (I’ll get more specific in the post as well). The most general things we can do is to begin to live Eucharistically (giving thanks always for all things unto God). This is the act of refusing to see anything as having existence or meaning in itself. It is the true sacrifice of praise and thanksgiving. The worship we enter into in the liturgy is in no way essentially different than the life we are to live at all times. It’s only unique aspect is that which is made present (Christ’s Body and Blood). But all things, through thanksgiving, become communion with God. They were created for this reason. With such a life, “things” begin to reveal their true reality and we see what secularism is blind to. I just finished the service of the Great Canon today with the life of St. Mary of Egypt. Her life is a profound example of change between a secular existence and a eucharistic existence. And the incidents of her life reveal the true nature of all things. Thank you, Father. Wise words about what goes in the Church of the Holy Sepulcher. I’ve read a couple of journalistic books about the history of that whole situation. It seems to me to be a microcosm of the kind of spiritual battle (with both good and evil in the mix) that takes place in the whole world, and I think your point about caring enough to fight to preserve the holy is one well taken. I also observe that the more intensely holy the meaning of a place, the more intense the battle with evil that takes place there. What all of the groups that lay claim to parts of this holy site still have in common is an understanding of the sacramentality of place and of the world (though one might argue with the exception to some degree of the Roman Catholic Church which has been compromised in some ways not common to the others by all that has been under discussion here. None of the other groups were impacted so directly–if at all–by the western philosophical movements that separated symbol from spiritual reality). Dinoship, I love Elder Paisios’ analogy of the bees and flies. God help us all be more like bees! I am heartily sorry if the video I referred to caused upset: I did not post it for party political reasons, or to suggest the people involved were any worse than anyone else. Where ideas and things are held dear disagreements can spill over into fisticuffs and worse (which is true whether the ideas and things are true or false, worthless or of inestimable value). Anything, from any quarter of the world which describes itself as Christian, and which shames the church grieves me: a public scuffle in the Church of the Resurrection is small beer compared with much of what had gone on in recent years. However, I take the message of the bees and the flies, and try to resist my fly-urges. All the same, in England, where I live, though a certain stripe of fundamentalist has a bad name (associated less with violence but rather with sanctimony and their slightly daft readings of scripture), on the whole the legacy of evangelicals – either from the established church or non-conformists – is a positive one. I think of Wilberforce and the slave-trade; Shaftesbury and reform of factory working conditions; Elizabeth Fry, and prison reform; Barnardo and concern for homeless children, Chad Varah and the Samaritans helpline, etc., etc. Concern for the poor, the marginalized, the ones who have no-one to speak for them, as per instructions. This is a tradition which is very much alive today. Andrew C, quite right… “evangelicals” (i’m not quite sure why we use that term rather than just Protestants) in Europe are generally more sensible than in America as far as I can tell (sweeping generalisation, I know but not altogether false). In Australia, where I’m from, it’s the same. Most Christians here are either Catholic or Anglican and the legacy they have left on society is positive – i.e. work for the poor etc. But let’s be clear, these are not fundamentalists. America, right from the very start, was settled by extreme Puritans. These were anti-establishment/vigilante types, who had no time for authority – ecclesial or otherwise (another sweeping generalisation, but, again, not altogether inaccurate). This is why you had witch hunts and all other kinds of nonsense like what was happening in the burned over district in the 19th century. I think this is why you get a very strange type eschatology called dispensationalism and rapture (yes this may have started with the Plymouth Bretheren (I think) in England, but it is mainstream in the US, not in Europe or any where else). It’s no surprise that fundamentalism is rife. The Christian landscape in America is characterised (not completely) by anti-establishment/conspiratorial types like Baptists and the Puritans – not to mention the cults that were spawned in this environment. Christianity is Europe and other Western countries like Australia and Canada just aren’t like this (many Americans just don’t get this). Dangerous ideologies like armageddon and trying to prove that Obama is the anti-Christ and so on just aren’t mainstream here. Andrew, how many Protestant Christians in the UK hold these kind of ideas? Not many at all I would have thought. Go to church on the weekend here in Australia, and the priest will tell you to be kind and loving to others. You won’t get Armageddon or some other ideology. And, quite frankly, perhaps it’s a good thing that American evangelicals don’t have a high ecclesiology and can’t agree on much. Else you might have a Christian sharia there, in some southern states at least. I think the fights at the Holy Sepulchre were between Greek and Armenian monks. Quite sad, but hopefully they can reconcile. And hopefully the Eastern and Oriental Orthodox communions can reconcile too. Simmo, what you describe of what you see as “American” (historic and contemporary) seems like a caricature to me (which always admittedly also have a grain of truth). I found similar spiritual dysfunctions among certain Protestant groups in England and Belgium (including Australians), where I have lived, relating to belief in the Russian forgery, “Protocols of Zion,” the number 666 and paranoia about European Union ID cards back in the 80s being tools of the Antichrist, for instance. This even infected the Orthodox world. Of course, it is possible that these ideas catching on with some in Europe and Australia were the result of U.S. influences, at least in part. (Since “Protocols of Zion” is a Russian forgery and another false prophecy fad “Nostradamus” that annually recirculates among conspiracy theorists comes originally out of Europe, though–along with all those Puritans–the U.S. can’t take all the blame for such spiritual craziness). You are right, though, that allowing for no more traditional state church to moderate such influences, America provides a uniquely accommodating environment in which this sort of sectarian “free for all” has been able to flourish. Trying to “prove Obama is the Antichrist” doesn’t strike me as “mainstream” here either, though his social liberalism and economic and political socialist leanings are intensely distrusted and disliked by social and economic conservatives (which U.S. Evangelicals more often are). On the other hand, I have never really been inside Fundamentalist Christian circles. Those who have may have had a different experience. Marc, point taken. There are many commendable things about the US. Although I have to say that American evangelical Christianity is dysfunctional in a way that it just isn’t in other countries. This is has a massively negative impact on society from my point of view. The language of hate and malice, the culture wars.. This is just completely lamentable. Simmmo (with HTs to Karen and Marc), I think it’s easy to forget just how big “America” is, especially when comparing it to other countries. We are more than 313 million people. The UK is about 62 million. Australia? Less than 23 million. I am no stars-and-stripes-wielding patriot but I will always enter the conversation to say this is simply an enormous country with some odd (compared worldwide) Constitutional freedoms that lead to likewise-odd social quirks. We -generally- think nothing about people having a loaded pistol by their bedside (though plenty of people lobby against guns, etc) and we -generally- have to let anyone set up any church they want with any practices they claim to have unless and until those practices interfere with local laws (the big case on this is from Hialeah, FL, something about sacrificing animals within city limits.) So when we have such allowances for a free-for-all “religious” atmosphere, all it takes is one congregation with one millionaire to finance one thing newsworthy enough that it hits national airwaves. Because “newsworthy” anymore basically means “rare” and we do celebrate (I mean that roundly, just that celebrity means “lots of camera time,” not that it is a good thing) our oddballs in that way. We can’t get enough of oddballs which is why there are so many shows about hoarders, doomsday preppers, Alaskan fisherman, dance moms, fire-brimstone Baptists and other niche-within-a-niche-within-a-niche populations. I do not like that these are the images and opinions that will be exported and used as examples about how my entire country is nuts (I understand that opinion, given such examples) but I do like that neither my government can’t control the media. And even if there are 2 million oddballs getting camera time in my country, that still leaves 311 million who are not. Most of us are not newsworthy at all. That’s a good thing. We have plenty of oddballs here. Our Constitution is also the most emulated in the world. The Bill of Rights is absolutely amazing. Nobody can handle this much freedom, though, which is why we seem to fight over it so much. But we only seem to. If your house has 2 kids, maybe it can look orderly and mannerly and unified. If your house has 10 kids, things get a little more chaotic and harder to explain and much, much louder. Doesn’t mean things get worse. It’s just different. Generalizing doesn’t offend me, and I think I understand most of it, but it’s just very difficult to generalize about the US. I’ve hesitated to get involved in this discussion… However, Simmmo has some important observations viz. American Christians (evangelicals in particular). There is a unique aspect – the connections between piety and patriotism (and various aspects of it) are particularly American – and they have roots in the Puritan roots of New England and various popular pieties that grew up here. The belief in American exceptionalism, a hallmark of some American political philosophies is rooted in a belief in America as especially chosen of God (a notion that borders on heresy). The strength of Darbyite dispensationalism and the forms it has taken in America has had a profound effect on American foreign policy since the mid-60’s. America’s conservative evangelicalism, and its political manifestations, are not (I do not think), a result of our constitution (which I would argue has not been a model for very many constitutions elsewhere), but the result of the unique evolution of religion and politics in this land over its near 400 or so year history. To be as transparent as possible – I am a political conservative – though not “evangelical.” I often make “common cause” with them at the polls – though for decidedly different reasons. American-influenced Christianity – I would agree with Simmmo – is among the oddest phenomena that have come about in Christian history. Most evangelicals I know are kind and modest folks who like to read the Bible and raise large families. Sure, they’re conservative, and often speak their mind on matters like abortion (as do conservative Catholics), but they are also charitable with their time and money, and have a great love of life in the Spirit. These caricatures don’t do anyone justice. Don’t hesitate, I don’t fight or bite. But I do think that anything we say about “America” or “Americans” can be demonstrably “proven” (we love polls!). I totally agree about the patriotism-piety thing being uniquely American. I just don’t think I can be convinced that my largest concern is “society” when it’s either false or not able to be defined anyway. I try to talk people out of thinking one piece of entertainment or one congregation’s demise points to SOME LARGER ISSUE all the time. Sometimes — often, I’d say — things are just what they are. The odder they are, the more attention they get, the quicker they will burn out. And since American-influenced Christianity is so odd to you, maybe just let it be odd. If it is the odd thing, there is a more-common thing already there. I think that’s a hopeful notion. One of the “advertised” aspects of this blog is “culture and religion” so we’re actually on topic. I agree, Hilary, that things are often simply what they are and may not point much beyond themselves. The unique aspects of American-influenced Christianity are important to me (as an American) because self-awareness is important to me (I would prefer to be conscious of what I’m doing – especially if what I’m doing deviates from traditional Christianity). I’ve had a maxim for years that any form of Christianity invented in America (for that matter, invented outside the Middle East) cannot be correct. And that, because Christianity is simply not an American invention. Thus, the Restoration Movement, the 1st and 2nd Great Awakenings, Mormonism, Adventism, Jehovah’s Witnesses, a vast number of religious denominations, etc., seem to me to be merely artifacts of American culture and in no way inspired of God. I would add the mega-Church movement and many aspects of American religion. I’m not anti-American about all this – but I recognize that Christianity is properly a transplant, and not a native grown species. The faith is, of course, within a culture, and will always take aspects of that culture within itself. But that also calls for a self-awareness. American culture is one of the most powerful engines of the present world (much like Hellenism was at the time of the early Church). The unconscious marriage between Christianity and culture that is occurring has aspects of which we should be critical (who else would be?). 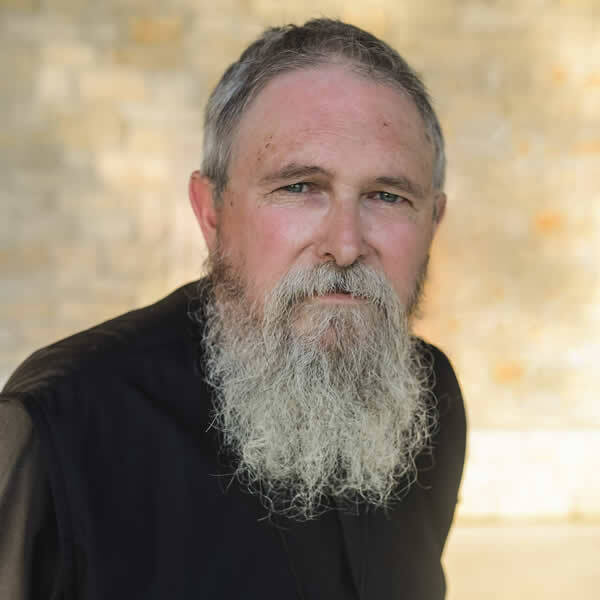 I am an Orthodox priest, and preserving the faith intact is a solemn charge given me in my ordination. That doesn’t mean protecting the faith from culture – but it means paying close attention to that. The “odd thing” of much modern Christianity – is that it distorts the very core of the faith – and that is more than an oddity. This is certainly beyond anything Simmmo was noting. But I frequently note such distortions. Gosh, I agree about evangelical people – they’re great. But it doesn’t remove the distortions within the faith created by many forms of American evangelicalism. I guess the important thing to state here – important because of the “bad dog” shame many Americans are instilled with – is that evangelicals, fundamentalists, and American Christians in general are not being written off as hopeless and damned. If they are, then the conversation is over. In reality they are not. Therefore the purpose here is to carefully investigate where there is truth and life and hope – and how to disentangle those from the seeds sown by the enemy. This is essential so that we don’t end up pulling the wheat along with the tares. Sweeping generalizations given in love are a possible tool for beginning the discussion, but it is a conversation that must not be rushed and may last for our lifetimes. Absolutely, and well said. There is a strong interest within evangelicalism in Orthodoxy and much conversation. Whatever else is true (including my criticisms), evangelicalism remains the backbone of American Christianity, and thus a major force within Christianity across the world. To engage it in conversation is among the many reasons I write. Speaking as an American, I am not alone believing that America is exceptional not by decree or destiny, but for mere practical reasons like relative size, wealth, and power. What’s more, all these things add a burden of responsibility that should sober rather than swell us with pride. I very much agree that America is exceptional in the sense of responsibility, etc. There are some who believe that we are exceptional by destiny or Divine decree. That would be heretical from an Orthodox perspective (as a version of phyletism). I am one who values the American constitution (for instance) and would like it if our present political life were more faithful to that constitution. But I don’t mistake that for any Divine decree. If I get into Divine matters, then I would have to say that America was incorrect in opposing England at the time of the Revolution, except that England had itself repudiated the Divine Right of Kings when it overthrew the Stuarts (James II). But, as a Christian, it is my duty to pray for the leader of the nation, regardless of anything, and to obey the laws where they do not contradict God’s law. If the laws contradict God’s law, then it is my duty to disobey and to suffer. This is an interesting thread. It almost seems like the subject took a full circle. We are pulling apart the symbols in culture and in Christianity to “better understand them”. We launch a diabolic (pulling apart, divide) so that we can look closer on the individual parts apart from each other. And then we are surprised when we “can’t fit them back together”. This scholastic approach towards Truth, this defining and dividing into smaller pieces will never lead us home. Yet, it is so deeply within us ever since the fall. We want to understand, we want to discover more, we want to “find the spring of eternal life”. Now, I do not say that I don’t believe that God is present in the details, after all he gave us the Law. He gave us definitions and the Word so that we can seek Him. The Word is upholding all life (even the details) in His Person. And this is where we then find healing to our diabolic (proper) state, in Christ. He , the symbol, “pulls the world back together”. As mentioned before, Christ gives the true value to the world by entering it. The world is a symbol (proper) becuase when Christ enters it (as a baby, on a colt of a donkey) the world becomes proper again. Wholeness reigns once more. This is manifest even on a scientific level where there is a constant exchange of energy to be able to keep the physical frames and laws that has been set. There is stability because of movement. There is revelation because of faith. There is Law because of freedom. I do believe proper Orthodoxy to be evangelical. And I do believe proper Evangelium to be Orthodox. Thanks again Fr. Stephen for your work. Hard to believe it at times, but yes, 2 Cor 3-18 sums it up well. Thank you Fr. Jakob, you are a wise man. Indeed, you are right: perhaps my wording was not appropriate enough. Symbols do remind us that there is something more than what we can experience through the senses, but this is only the first layer, or the first contact between man and symbol. As we discussed before, a symbol could be a skandalon, a stumbling block that prevents us from exploring the material world smoothly by standing out in one way or another and making us wonder and ponder on its meaning. However, this is only the beginning of what a symbol does. And of course, I don’t mean any symbol in the secular sense, but strictly what the Church considers to be symbols, in the widest sense (including icons, liturgical arts, church architecture — to name only the artistic ones). 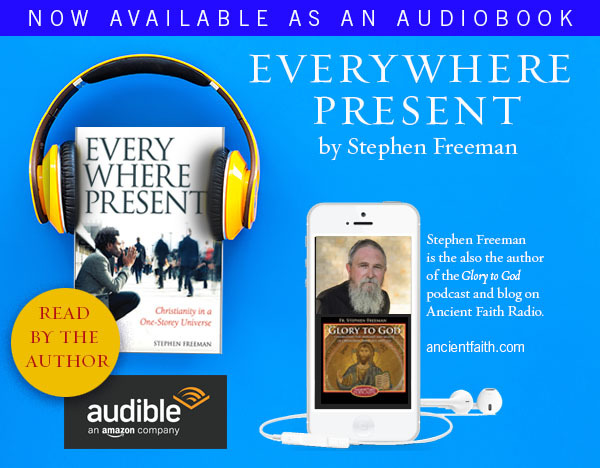 Fr Stephen: I can do the “artifacts of American culture” language (and I like it) and add to it that if we’re all created yearning to go back to God of our own free will (sorry, not sure how you would say that part), then what I see in anything secular-American culture is that same yearning, misinterpreted. This is the “trying to fill the God-shaped hole” idea. So it might look superficial and “secular” but it’s easy for me to see that this same yearning, misinterpreted, is what drives people to do some of our nuttiest American things. The newer a congregation, the more they use the word “liturgical,” for instance. Orthodoxy seems to be what they’re yearning for, but they’re still on some other temporary superficial trajectory so it’s, like, simply daunting for them to think church is anything more than a place you go to on Sundays that offers free childcare. I frequently divide the words church and faith when talking to people but with you they of course converge. I think that’s what I mean. Which feeds nicely into the two-storey thesis. If we ask men to give us a church that is only a community center, that’s what we will get. And we’re not satisfied. Because mere culture is giving us what we merely want. So we yearn for more. And that yearning is what I like to see. Even on television, even in the news, even with frivolous lawsuits or other “nuttier” American things. We still want something and this culture is not delivering it, in fact I know this culture cannot deliver it. Again, a hopeful notion. People still yearning. Rather loudly these days. Regular readers of this blog probably have a “when I” conversion story that ends in one place where they found — speaking euphemistically — relief. Some other people are simply in the middle of their own stories. I see nothing but hope there. If I ever let “secular culture” get me down, that’s still just my tiny little brain assigning power to some vacuous nothing. It is not real. It is not reality of itself. Nothing can be without God, like, nothing can actually exist outside of God — I can’t emphasize this without gestures or inflection. Which means I’ve written too long again. I think I would agree with what you’ve said. That hunger exists and it comes out – even in our nuttier moments. Your hope is encouraging. Especially your understanding that everything yields evidence of our hunger for God. I think that is deeply true. I have no hope about our culture (as you note – “this culture cannot deliver”). There’s nothing within Scripture that should make us hopeful about culture, or its future (short of Christ’s return). I’m nearly 60, and have not seen a very hopeful tragectory to our culture or nation. However, I am very hopeful in Christ and think that all things are possible in Him. There are many things that I never would have thought possible in my lifetime that have come to pass in Him. And I’ve seem some nutty things that I would never have dreamed of – and will, doubtless, see yet more. But tonight I will think about our nuttiness, and everything else under the One-storey vision of our hunger for God. That is worth a very hopeful heart. Thanks! Thanks for your comments hilary. I would say, however, that I wasn’t talking about the broader American population, but rather the Evangelical population. Still, the influence Puritan ideology has had on broader American society appears to be pervasive. And Father Stephen, perhaps I wasn’t clear, but yes I do believe Evangelicalism of the variety found in the US (and elsewhere too, but particularly in America), is not merly strange or “odd”, but it is a distortion. I likened Evangelicalism to Gnosticism in a post above. I notice that Father Jakob has a post on his blog making similar points that I made about secularism and Gnosticism. Anything that colludes with Gnosticism is a distortion. Let me have just a little say about politics. I don’t want to get into arguments on particulars, but I feel like American Christians really do need perspective on this. Christians in other countries really don’t equate conservative theological positions with conservative political positions the way it seems to be done in America. Many traditional Christians here in Australia, whether evangelical or Catholic, get involved in social and political activity on things that I feel many traditional Christians in America would be very uncomfortable with. We do have many nominal Christians, who are basically secular. For these people, Christianity just does not inform their political decisions. I would say the conservatives here are not necessarily (if at all in this day and age) associated with Christianity. There is a worrying trend amongst some Pentecostal Christians here who are trying to emulate something like the Religious Right in America, however these people are marginalised in political discourse.The other thing to say about conservatives here is that they are very mild compared to conservatives in the US. So I guess my point is that other people around the world just don’t put politics and religion together the way America does. I found this video of NT Wright commenting on American culture wars. I basically agree with him. And, as Wright points out, we have our own cultural hang-ups that need to be addressed as well, which those looking in from the outside are probably in a better position to point out to us – so this isn’t a “my country is better than yours” thing. But anyway, this has been another helpful discussion. Much appreciated. NT’s thoughts are interesting, though he actually has a mis-perception of the Christian right (and conservatives in America). He uses creationism (anti-evolutionism) in America as an example. It’s actually a very marginal position among American evangelicals. Fundamentalists are a minority within evangelicals, even in America. It has very little political play as an issue in the US (though a wee bit in Tennessee – where the famous “Monkey Trial” took place at the moment). Primary conservative positions (social) in America are 1. Right to life for unborn 2. Opposition to Gay marriage 3. End to government intervention on the side of social engineering (various liberal agendas). Other things are mostly libertarian matters such as smaller central government, etc. My own commitment is centered primarily in the protection of the unborn. Like the abolition of slavery, I see this as a matter that should not be an object of compromise. If a child in the womb is a human life (which is the received tradition of the Church) then its protection should be as absolute as that of any other life. As for other political positions (which I cannot say have any particular “Orthodox” characteristic – unlike the protection of the unborn), I tend to oppose almost all statist schemes (on the left or right). The experience of the 20th century would argue that powerful states have been positively harmful for human well-being on the whole. With the advent of increased digitalization and globalization, concentrated power would seem to me to be an even greater danger than ever. The EU is positively frightening to me in its increased centralization of power and absurd bureaucracy. That its states are as secularist as they are (with growing antipathy to Christian expression) only increases my concern. The absence of serious Christian opposition to abortion in much of Europe is simply an example of how banal much of Christianity has become there. Such an easy peace is embarrassing. American evangelicalism and fundamentalism has a sort of “cowboy” image elsewhere in the world (and is easily caricatured for that) but they have been a bulwark (along with traditional Catholics) in their opposition to abortion. The US may be one of the first modern democracies to turn back the clock on that issue. I don’t expect anyone to agree with my political thoughts – just thought I’d share them in this conversation. It’s part of the buzz in America at this point in the election cycle. I am probably more concerned about the moribund character of much of Christianity across the world than I am about anything political. I am generally pleased with the re-awakening of Orthodoxy in Russia and much of Eastern Europe – and pray that God will protect the Church there from its manifold temptations. I think the faith will need a strong voice in coming decades (in Europe particularly). I hope the Orthodox will be able to provide that. It’s very interesting to have conversations with non-American Christians about these things. I admit that I have not browsed all of the comments, but I must admit that I’m uncomfortable with the general tone of them. I would agree that Fr. Schm. is correct in his emphasis on Sacramentality being incompatible with a kind of worldliness, and driven out by the same, but the roots of this worldliness are not generally understood (ignorant of historical roots, people come up with false genealogies that are only of practical help to them for certain — sometimes questionable — ends, but which are historically false). I would urge people to look at David Bentley Hart’s work in this regard. There are other books that are also very good. The truth about where we are and what we’ve left behind is uglier than most people are able to handle, I think, which explains much of why these genealogies proliferate (they have a narcotic effect). Secularism is not an ideology that can be circumvented or “taken down”: it is simply our cultural condition. The way forward must include a real liturgical life, and a real ascetical life, but if these are treated as flags to rally the troops, or as weapons against our current context, they will easily (and quickly) become impotent idols. We are not good at being honest about who we are, where we are, or what we’re really doing. Thanks for your comments Father. I would agree that the political dialogue in other Western countries is sorely lacking a traditional Christian voice. This is something we can learn from American Christians (although I don’t really agree with the way this is projected at times). American Evangelical action on abortion should be mostly applauded. But I’d also say that conservative Evangelicals are not as concerned about the plight of the poor than they are about other social issues (in my more cynical moments I’d say that the conservative evangelical love affair with libertarian philosophy seems to be more about finding a moral justification for selfishness than for any genuine concern for freedom…) I think issues surrounding poverty are just as worthy of passionate Christian lobbying as the issues of abortion and homosexuality. This seems like sound thinking to me. I’ll be interested to hear more about what you mean at another time perhaps when your schoolwork isn’t so pressing. I’m not sure what you mean, for instance, by “genealogies” in this context. I surmise perhaps you are referring to historical developments or people that we are perhaps linking present circumstances to inaccurately or unfairly. I’ll be the first to admit that with regard to lot of such details, I’m speaking from relative ignorance and very limited and narrow experience and likely using much too broad a brush when I generalize from that experience. Thanks for popping in to the discussion. One unfair critique of conservative American Evangelicals is that they don’t care about the poor merely because they do not trust and support state-run programs. The US constitution puts limits on the federal government to prevent it from usurping traditional roles belonging to private institutions like churches, families and voluntary associations. by Politics and Religion. Having lead a research team at the University of Virginia to develop a catalog of culturally vital moral foundations, his book analyzes the moral intuitions of popular political ideologies against these foundations. One conclusion is that the moral vocabulary of American religious conservatives is quite balanced. He also finds that left-leaning “liberals” do not emphasize all the moral intuitions a healthy culture needs to endure. “Secularism is not an ideology that can be circumvented…it is our cultural condition.” I do not think the culture can be “taken down,” but I do not think that Orthodox Christians are in any way bound to live in the thrall of heresy (of which secularism as defined by Fr. Alexander is a permeating example). Like many such things, conversion is a daily, ever-pressing part of life. Hart’s work is useful. It is sometimes divergent from the flow of Orthodox conversation over the past 50 years or so. I would not mark it as a touchstone in the manner of Fr. Alexander’s work. The “genealogy” viz. the “Western Captivity” is not an exercise of academics but a description of an existential reality endured by Orthodoxy following the fall of Constantinople and the rise of Western dominance (with plenty of friendly support by various Tsars and the like). It’s origins (like those of secularism) are ultimately only of academic interest. Actually, Fr. Stephen, when I came up with the handle so many years ago it was out of deference to Abba Poemen, and a slight to Nietzsche. I need a handle because if employers search my name (or teachers, or classmates), and I do not measure up politically, it could cost me a job — or entrance into a program, or whatever — because the environments in which I move are so highly political that I would easily be blacklisted. I have a family I need to care for, so I don’t have the freedom of using my real name. I’m not sure I understand what you say about Orthodox Christians not living in the thrall of heresy, mostly because I entirely agree with you (we should not), but in that agreement it would seem to make your stated disagreement with what I wrote a bit odd. I think we might just be operating with different definitions of “Secular” and “Secularism.” Secularism is a much broader condition than anti-sacramentalism, though a perversion of the “one floor universe” you advocate for is part of it (only one floor, exclusive of God or Paradise — it is the two-floor version you often and rightly lament, minus the second floor). It refers to law, politics, and morality, as well. Regarding Hart, I’ve only read several of his shorter articles (which are excellent) and most of his work “Atheist Delusions,” which I had in mind when I recommended him. I haven’t read his “Beauty of the Infinite,” so I entirely defer to you on situating that work. What he wrote in AD, however, was very accurate. Better, in many ways, than what I recall Fr. Schm. writing, though they’re coming at it from different angles (Hart is more comprehensive, and knows the history). Also, I’m really not sure what the “Western Captivity” is. I am suspicious, admittedly. When moral intuitions are valued based on their effects vis-a-vis “longevity”, then morality is valued _for the sake of something else_ — in this case, because of its usefulness for a very secular, a very _worldly_, type of flourishing; for “health” in an almost biological sense of the word. I don’t mean to defame worldliness as such, only to say that this type of argument (valuing things that could point to a horizon beyond worldliness for the sake of worldly things) is an expression of Secularism as our cultural condition. Yes, I think the different definitions of secularism would explain much. It is a theological secularism that Schmemann identifies, and that I work with in the One-Storey Universe model. Although, I would argue that everything is ultimately theological and would gladly trespass on law, etc. It’s more than an anti-sacramentalism – indeed, Schmemann would have described the Roman Catholic understanding of sacrament at the time of his writing (63-73), as a secularized sacramentalism. It is that very form of secularized sacramentalism that he saw within Orthodoxy (having been imported through contact with the Latin West from about the 1700’s forward) that occasioned his writing against it in his book, For the Life of the World. He was not a liturgical reformer (as some seem to want to cast him) but someone who sought a reform of understanding and true conversion toward the Kingdom of God, made fully present to us in the Church. Thus he is deeply critical of what was the dominant “Western” understanding of sacrament (it certainly dominated the “manuals of theology” that ruled the theological world of the early 20th century). Schmemann’s work specifically challenges the “manuals of theology” that had come to dominate theological education (both in Rome and in Orthodoxy) and which had a place in theological life that we can hardly imagine. Orthodox freedom from such tools is quite modern (theology in Russia was taught in Latin until the mid-19th century, for example) – and is not yet complete. RC theology is, today, almost liberal-Protestant in comparison to its earlier history. It is this “on the ground” kind of knowledge that I find lacking in Hart and his historical analysis. It’s like Augustine or Aquinas. No one ever read them. They read florilegia and manuals of theology that presented quotes and succinct summaries. It is this Augustine and Aquinas (for instance) that much of Orthodox critique of the West is aimed at. It’s an Augustine that cannot be found by actually reading Augustine (for example). I’ve imperfectly represented Haidt’s work. Teleology is not essential to his theory. “Moral foundations” and “moral intuitions” are technical terms and to understand them the book must be read. His statistics show how these six “foundations” align with “moral intuitions” that animate popular political factions in the US. He found, for example, that the most sacred value for political Liberals is care for victims of oppression. For Libertarians individual liberty is paramount. Conservatives most value preservation of institutions and traditions that sustain a moral community. Something I learned from Haidt is a fuller and more effective vocabulary for discussing the intersection of morality and politics, especially when the values people express seem to be at odds. What? This is simply not true, unless “RC theology” is defined by the likes of Hans Kung. Phillip Jude, perhaps it’s more that the gentiles have failed. I am referring to method rather than content per se. The “manuals” are part of a bygone era. Ah, I see. Well, good riddance. Fr. Stephen, it is hard to hear you say in essence that we haven’t learned Augustine and Aquinas, among others, if we learned them through the “manuals.” I feel a little pinched by this critique because, in my case, it’s fair. Satisfied for decades with systematics, summaries (and caricatures), I often didn’t like Augustine’s writings, or Luther’s, for example, because their corpus just didn’t fit the crisply ironed suits my preferred sources had tailored for them. *** I have a question about Fr. Schmemman’s “For the Life of the World”. I believe it is germane and as vital today as it was when written, but what do you think of the presentation? I ask because some of the discussion, like “social gospel,” is technical and a little anachronistic. This post helps to introduce the book. Do you have other thoughts to share with people who are about read it? I promise you that mutations of the “Social Gospel” are alive and well. I would be interested in these reflections from you, if you don’t think they would be misleading, inflammatory, or otherwise out-of-bounds for public consumption. Great question and good observations. I think most of us are unaware of the huge role that “manuals” (for lack of a better term) have played in our acquisition of lots of knowledge. One of the things I have most appreciated over the years was my college education in the “Classics.” We learned Latin and Greek and read original works of the authors (Homer, Plato, Sophocles, Cicero, Pliny, as well as the New Testament and some of the fathers). It was a different way of acquiring knowledge. I had a friend who taught himself Latin by reading Aquinas (that’s a very serious effort). For the Life of the World is still a very important work – even if some things may occasionally feel anachronistic (though the “social gospel” has morphed a bit). Though it is a short book, it is a very deep book. If it is possible for someone to read a chapter at a time – digest and discuss with someone – all the better. I know from conversations with others, that many people miss some of its most important points. This is particularly true with regard to the sacraments. His criticism is of Westernized sacraments. Think of it as a world conceived in a secular manner – where stuff is just stuff. But through this special prayer or ceremony – something “supernatural” (contrary to nature) happens and the merely natural now becomes something it was not before (the Body and Blood of Christ, etc.). These discreet events (all seven of them) are almost anti-sacraments in Schmemann’s critique. He says that this understanding actually underwrites and secures the world as a secular entity (having an existence apart from God). In classical understanding (of the Eastern fathers) everything has the character of sacrament. The world exists (naturally) as sacrament and icon. It is creature of the Creator and reveals God. So, we should rid ourselves of the category natural vs. supernatural. The “supernatural” is also “natural” or at least not contrary to how things are. In this manner Schmemann speaks of symbol and its ancient meaning (as in the Eastern fathers). A symbol not only points to something else but the something else actually participates in it and is made present in it. This is true of all nature (he would say). All of nature is symbol, is symbolic. It is a very strong meaning of the word symbol. Without this understanding, nothing he says will make sense. So that when bread becomes the Body of Christ, it’s role as symbol is not new – it is always symbol. What is new, is what it is symbol of. 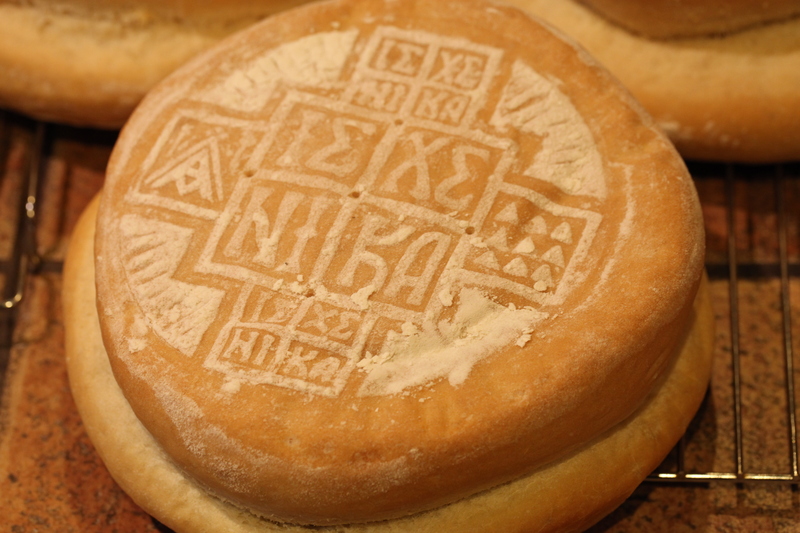 Of course, when I say that the bread is symbol of the Body of Christ, we can hear how weak the word symbol has become. In the modern ear, it is the same as saying that the bread does not become the Body of Christ. Schmemann says that the terms, “real” and “symbol” are not exclusive of one another – and this is a central point. It returns the meaning of symbol to its original state. When Schmemann says that the sacrament “reveals the bread to be what it already is” (the language of St. Basil in the Eucharistic prayer is similar, “show this bread to be the Precious Body of Our Lord, and God and Savior Jesus Christ”). I used to always hear this just about the bread. I’ve come to see that he means this about everything. Everything is more than it is. It is a one-storey universe. Until we see everything as more than it is – and know the more as well – then we do not see reality and will not know the Kingdom of God as it is given to us. I hope those are helpful thoughts. I’ll be writing more. I think you might appreciate the book “The Wellspring of Worship.” It reveals another Catholic take on the mysteries, one that should be familiar to Orthodox. The author is an eastern Catholic, I believe. Glory be to God, blessed undivided. I really wanted to ask something. This really makes me sad. I’m young, and after high school, I originally chose a path which would have, most probably, lead me to becoming a “secular Christian”, and I failed on that path. This world defeated me in its own game. So I couldn’t finish the journey… I realised that I have chosen wrong in life, and, in the midst of that realisation, I thought it would be the time for me to return to the One I have been avoiding… But it wasn’t just about prayer, it was about who I am, my way of life. I wanted to be closer to God, always, so I thought of joining a University of Theology (so they are called here in my country). But I didn’t feel up to it; I’m not strong enough… So I decided for the next best thing in my possibilities: becoming a teacher (in mathematics… that’s all I can). And, I can say that I am pleased with this choice; it gives me the peace I wanted. It fits my abilities. And it offers me the chance of working closer to the young ones and of helping them when in need. But most people, including my close ones, my beloved (and they’re all Christians, just like me), make me feel bad on lots of occasions because I have lost some money in this change (a year’s worth of tuition fees…), because I have chosen a lesser respected path, which would bring me less money, because I am not in the top industries, in Computer Science. Nobody cares about what I felt – what made me change my path, about my inner peace, it doesn’t matter that I care for them, nobody cares that I have other ways of becoming joyful, other than material things; nobody cares that I chose to follow the God of love (they don’t think about this)… Nobody even cares that all things are better for me now, although I didn’t believe my hopes would become true. I just can’t bear it sometimes. All they talk about is having the best jobs, having success, others’ respect and, implicitly, money. In their eyes, I’m just another frustrated human being, I’m a failure, and I can’t change that as long as I stay on my path. They think that to be a Christian also demands to be successful in this life, to be respected and to have a good financial situation, which – and few would confess – means to be tough and above others. So I’m also a failure in God’s eyes. How can this be? What can I do? I feel sick at the thought that my whole existence will be thought as a failure, even though I wanted to have a life closer to God. Why doesn’t it matter that I want to put higher price on love, more than on anything else? This makes me feel alone and abandoned. Why can’t they see they’re hurting me? That they’re making me, slowly, abandon my path? I’m not sure I fully understand this, however: “Your mercy shall pursue me, all the days of my life”>> Is there more to it? Turn your ear away from those despondent thoughts. Pay them no heed. Our enemy will find ways to make them seem more worthy of attention, but you must persevere in ignoring them and trusting in God’s providence for you. Repeat the Jesus Prayer without doubting in His mercy. Doubts in that matter is what Satan would dream of cultivating. Even if you were to do the wrong thing, the worst of the wrong things, God would have only allowed it to occur if He knew some good is going to come out of it in the end. He is our saviour, (not our own efforts). Our efforts are simply our thank you. Thank you, again, Dino, for the thoughts! I am always told to find a good spiritual Father… It’s quite hard for me… But I do see the great importance… It is extremely hard to be alone, especially if you are young and a beginner… But I do, always, search for other people who believe in the God who is love. And it brings me great pleasure to find such people. 🙂 May God bless you all! I understand. It is true… I hope I will find a Spiritual Father soon. Thank you! It seems to me that it would be easier to perceive that “the earth is the Lord’s and the fullness thereof” if I didn’t encounter such constant suburban sprawl on a daily basis. When I see the visual beauty of nature, or of our Church buildings, or of Buddhist temples in foreign lands, or in primitive settings like I might see in a National Geographic magazine- then such a declaration in the Psalms makes sense; the world is perceptively symbolic. In such settings, it is as though Christ can be felt invisibly present, standing within the material world, making offering before the Father. But here I sit in a grey cubicle at work, in front of a computer monitor. And to get here, I drove past miles of suspended power lines, and some pretty run-down parts of town. Maybe, with some difficulty, I might be able to come to perceive that this part of “the earth [where I live] is the Lord’s”- but it sure feels like I just have to take such a statement on ‘blind faith’. The whole suburban way of life feels like a barrier- not only choking off awareness of God’s presence, but a barrier to just simply being alive. I am very seriously considering exiting the whole American scene- taking the family to live somewhere remote and quiet. If it were up to me, I might choose the middle of a jungle somewhere, I think, but my wife does have her limits. But what I am wondering is whether such a drastic move toward a primitive life is just escapism- maybe it would be more beneficial in the long run to keep grinding along here, hoping to one day come to perceive the true symbolic character of this modern world (which is presently hidden from me), a world that does seem to me to be mostly secular or profane. A few thoughts. What you are describing (and I understand the frequent ugliness of our landscape), is essentially an aesthetic judgment. Not an incorrect one. But to perceive that the earth is the Lord’s and the fullness thereof is not an aesthetic experience – it is “theoria” – contemplation – the perception of what is true. The faculty of judgment (rationality) gets in the way of such perception. It is done from the heart (nous). I had such an experience recently. I was on my morning walk, and was praying as I walked along. I purposely opened myself up to perception, rather than judging. The streets of my neighborhood have a certain beauty, but the housing is not so good in many places, and people are not always that careful about things. But I did not see things that way. Even the wiring – which runs everywhere in the upper storey of the streets didn’t bother me. Instead, I began to think of the wiring as relationships – the connectedness of our shared existence. They were a community that is often not expressed in any other way. And I began to pray for the neighborhood, seen in this new way. It didn’t make the wiring prettier or pleasing. But just that slight “side-step” a small adjustment in my viewing, allowed me to see something I had missed. Beauty – the beauty perceived in theoria – is present everywhere at all times. It is only occasionally present aesthetically. If we live in an aesthetic mode – we will find peace nowhere, for sin will manifest itself as ugliness and will find us out. Wonderful. Something to ponder on in anticipation of the 24th of September, the day on which the eastern Church celebrates the repose of St. Silouan. Christ manifested the perfection of the Divine image in man and the possibility for our nature of assimilating the fullness of divinization to the very extent that, after His ascension, He placed our nature “on the right hand of the Father”. So, in Christ Jesus we find man’s rightful place, “on the right hand of the Father”, sharing in the divine Life; but, as with the two natures in Christ, man has been called to be united with God without mixture or confusion of any kind, that is to say, we never cease to be His creatures, since He alone is Uncreated. This fundamental distinction is of inestimable significance in Patristic theology. Source: The Orthodox Understanding of Salvation. “Theosis” in Saint Silouan the Athonite and Elder Sophrony of Essex. Dr. Christopher Veniamin pp 4-5. Father, you mention an important point: perception. The feeling of God’s absence, the ennui of materialism and the dark rebellion of nihilism have one thing in common: the perception of not-God. We either place ourselves in God’s place as we idolize the created thing or because we ‘feel’ He is not real, descend into a limbo of sorts which we take as reality. Your perception was changed not by any rational process but by prayer. You surrendered your perception to God, to some degree at least. Two things: the act of prayer in this case was communal and it was in prayer that He was changed. He didn’t just reveal Himself like a dramatic magician or something like that. Learning this and the ability to give glory to God in all things are complimentary disciplines that allow our perception to be changed and glisten with light, or so it seems to me. Hard to do in the midst of our existential troubles, at least for me. Father Stephen, thank you for your words. I am still chewing them over. After my wife and I had been married two years, we moved to the top of a high hill in the mountains. I remember a friend coming to visit us and remarking one morning that he could see why ancient people would have assumed that the mountains were home to gods. The aesthetic beauty of the place had a magical quality that was not just visual candy, but seemed to make its impress on a deeper level. As you drove around, people would wave to you. Neighbors talked to each other. We left that town when we had three kids in diapers and felt we couldn’t handle the burden apart from the help of family. Where I live now, it’s pretty typical suburbia. But when I am trying to pray silently at the end of a week, I can feel the thump of dance music from a restaurant a mile away. I don’t know if I yet possess the strength of ‘theoria’ to look deeper upon things in order to see the hidden reality of the way things really are. It is apparently possible for someone to achieve this ‘theoria’ even within the context of aesthetics of modern society. But it feels like an uphill climb, where elsewhere the aesthetics would naturally lend themselves to growing into this higher way of looking upon the world. I have noticed that monasteries intentionally remove themselves from all the distortion. Why don’t some of us do the same? It seems to me, a more ideal Christian life might be to live in a small community, like the Hobbit’s Shire. This is probably my Mennonite ancestry speaking through me, but why not form an Orthodox communities, in a beautiful setting, where we see each other every day, where the town joins together daily for Orthros and Vespers. Where we don’t have anywhere else we particularly need to be going. Just dreaming, I guess. todd, why not indeed. Many of the Orthodox people I know feel the same way yet….there is a point to being in the world, but not of it being the salt and light to world. Monastics seem to withdraw so that they can do battle more intensely, not just for themselves but for us too. To experience all of the heartache, ugliness fracturing randomness of the world these days and still love because of Christ’s love for us, not just the people around us, but the beauty of creation in even the smallest thing….that is a work. A work I am far from achieving but still…..
Maybe I am wrong, maybe it would be better to form the type of community of which you speak…. I sympathize greatly with what you say. Has it not always been the case that closer union with Christ leads to greater rupture with the secular world? Always! Similarly, an unrelenting search for stillness, or at least a quest for privacy and quiet is certainly a most natural reaction for those who hunger to converse with their beloved Lord. Even if they know Him not and just suspect something special in their desire to seek Him. However, in the (suburban) circumstances many of us find ourselves, we typically have sufficient opportunities to at least demonstrate (to ‘prove’) this desire to be with Him. Him only. Likewise we have ample occasions to perform His will rather than our own. We get chances to say “no” to an attractive distraction in order to say “yes” to the Jesus Prayer at least every day –even if for short periods of time; or we have opportunities to accept a harsh word meekly. These are sure ways of attracting God’s Grace. Ways of behaving in a Christ-like manner. Ok, undoubtedly, such visitations within the diametrically opposite context of a harsh (or beautiful) ‘desert’ can be far better assimilated, better preserved or simply better enjoyed. But the truth of the matter is that –in a sense- it does not matter if we see God but if He sees us. As the Psalmist would say: May You look upon me… And what makes Him “see us” is not just our sacrificing of the world to go to a relative wilderness (when/if we do that for Him rather than for ourselves), but the fact that all our reactions are as similar to those of His Son as possible. We can do that in a busy city -as He did- or in the wilderness – as He also did. There are such communities. Eagle River in Alaska is a particularly excellent example. Other parishes communities worked on creating “parish in walking-distance” communities. A number of parishes that were once “Evangelical Orthodox” but who came under Antioch, some the OCA, later, did this quite successfully. I’m familiar with St. John’s in Memphis, TN, as a good example. St. John the Wonderworker in Atlanta, GA, originally part of the Christ Our Savior Brotherhood, did a transformative work near Grant Park and has been genuine salt and light in a community that was in serious decline. I know of others as well. Such efforts have been as much driven by mission to the world, and desire for deeper community, as anything. This nation could certainly use far more of them. They have been quite effective in urban centers – there are many deserts in the modern world. But, again, aestheticism is insufficient for such a vision – for sin is present everywhere. Theoria is not only for the few, but, can be, on some level, a normative part of the Christian life.